It has been a solid 2 months since I last posted anything here. Not because of anything in particular, just because of life in general. I have taken two trips this summer, but I’ve also been home a lot, enough to have been blogging at least a little. But I didn’t. It amazes me sometimes when I look back on the blog and see that I posted frequently during an especially busy time and now, when things aren’t really that busy, it takes me this long to post and I miss June and July Daring Bakers after not missing a challenge for over a year, during which time I had a baby. How did I have the time then?! Hopefully this new project will give me some incentive to blog more regularly. I’m pretty excited about it! These posts will also be featured on Alpaka Van! Something else I am pretty excited about. If you’ve been to IKEA and you’re in to food, then there is a good chance you’ve noticed this cookbook before. I bought it because it was a cookbook, of course, but it was also very visually pleasing. Every recipe includes a photo of the ingredients similar to this one. Isn’t is great? The title, Fika, is a Swedish tradition which kind of translates to “to have coffee”. It’s a time when you gather in the afternoon and enjoy coffee (or tea) and sweet treats, typically with company. I had the pleasure of enjoying fika in Sweden when I visited with my mom and sisters 8 years ago. I am in full support of bringing the tradition home. I’ve decided to bake my way through Fika. I love the simple recipes and the clean and creative images of the ingredients. Another reason I was drawn to bake through this book is that my sisters and I have grand plans to open up a shop together (one day…*sigh*) and my role would be to do the baking, so I have to get some practice with Scandinavian style baked goods. Starting with a simple rulltårta or jelly roll seemed like a good choice. 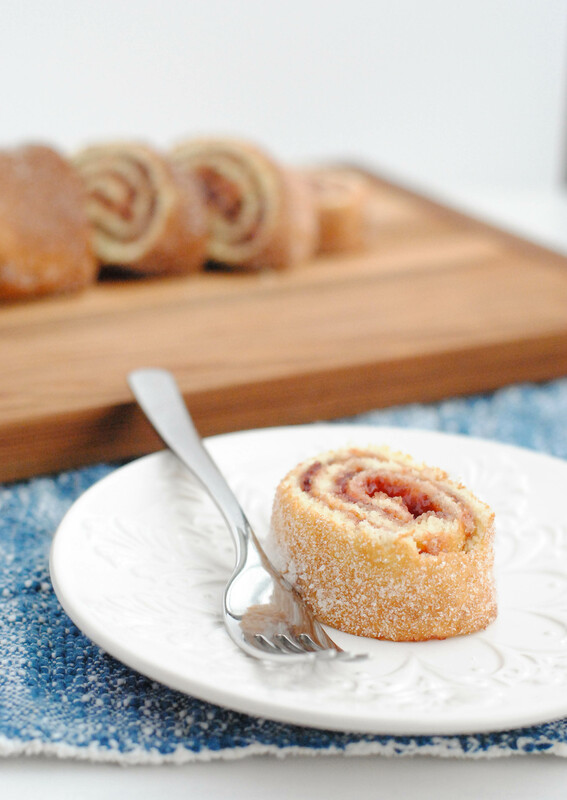 I’d never made a jelly roll before, but how hard could it be? Turns out that it can be tricky. The first time I used a non-stick silpat…but it stuck terribly. The next time I used parchment which, while much better, still did not release the cake cleanly. Any tips? Before turning the cake out onto a clean dish towel you sprinkle it with sugar, which makes for a beautiful and sweet exterior. The cake is light and sweet, and the tart jam is a good contrast. The slight crunch of the sugar is also a nice contrast against the soft cake and filling. This is best made and served the same day, but can be kept in the fridge for a few days and still taste wonderful. It just starts to get a little soggy as the cake absorbs the jam. I am so looking forward to this project and can’t wait to try another recipe from Fika! Heat the oven to 475°F. Line a large baking pan with parchment and move oven rack to the bottom third. Beat the eggs and sugar on high for 4-5 minutes, until light and fluffy. Combine flour, baking powder and salt in a small bowl. Add in to the egg mixture, gently fold a couple times, then add the milk and extracts. Continue to gently fold together until combined, but not overly mixed. Spread the batter evenly onto the prepared pan. Bake for 4-5 minutes. Remove from the oven and sprinkle the cake with sugar. Place a large, clean dish towel over the cake and carefully but quickly invert it. Peel off the parchment carefully. Spread the jam over the warm cake, then roll it up and place seam side down on a cutting board. Let sit for a few minutes, then slice and serve. Looks perfect! We have a British version of this, which is called a jam swiss roll. I make one occasionally. I find you just have to work fast with the rolling up part and have also used parchment, without any problems. There’s nothing like setting yourself a challenge to get inspired and motivated! 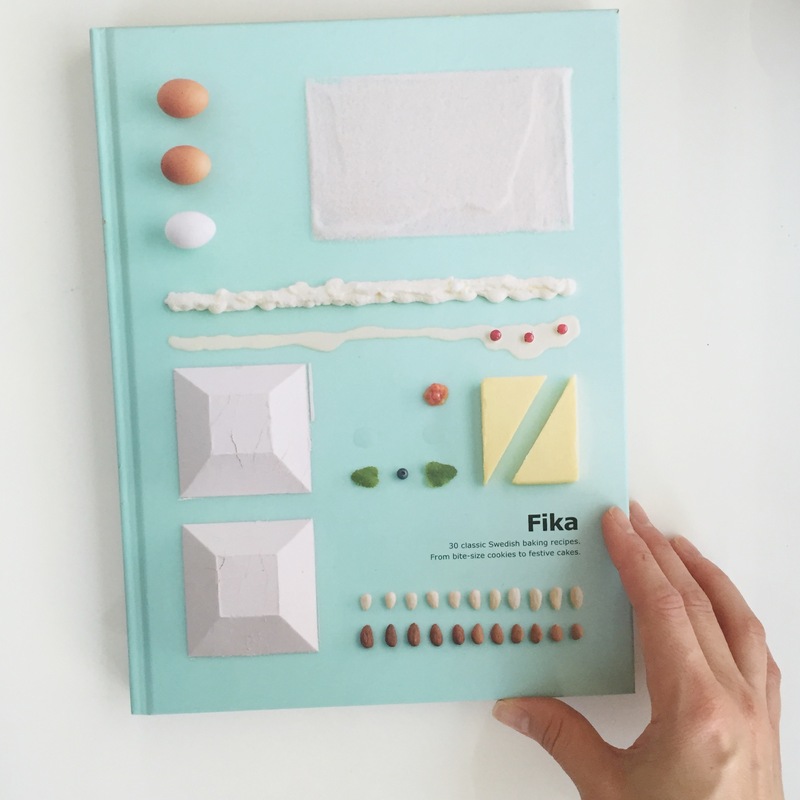 I’m looking forward to seeing what you make next from the Fika book! It looks so good! 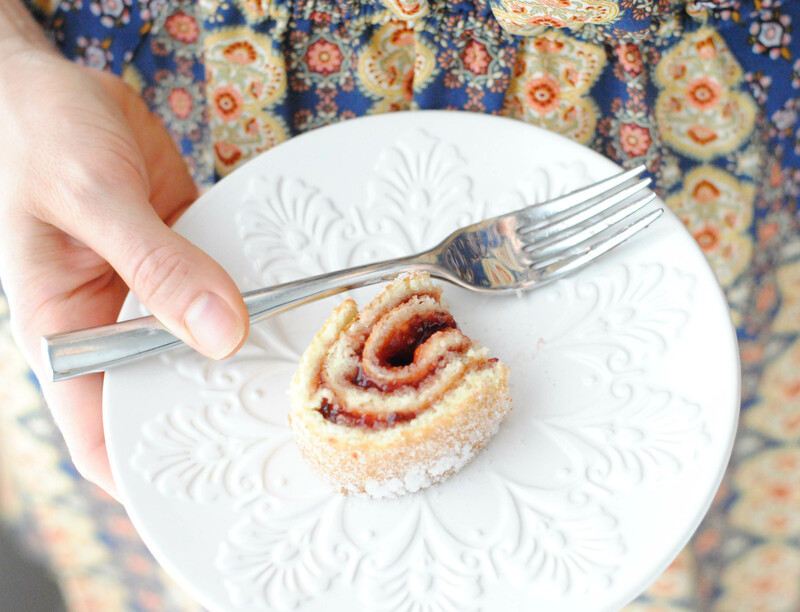 I was scared the first time I made a jelly roll cake but now it’s one of my favorite things to make! I typically spray the pan with non-stick baking spray, line it with parchment paper and then spray it with baking spray again. I haven’t had a problem getting the sponge cake out of the pan when I do it that way. I can’t wait to try this recipe! Thank you, Allison! Great advice for the jelly roll! I’ll try that next time.